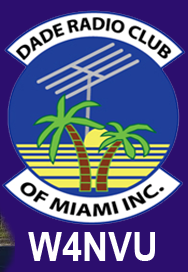 June 2014 – W4NVU – Dade Radio Club of Miami Inc.
Meeting was called to order at 19:23 with 44 present. We have a quorum. Julio presided over the meeting and welcomed everyone. The meeting was not broadcast live on the air tonight from the EOC. There was testing being conducted in another room tonight. Everyone took turns and stated their name and call sign. Julio welcomed everyone again and that we have a guest speaker tonight. Lloyd will speak to us about Hurricane Preparedness. Julio reminded everyone present tonight to sign in. Secretary – The minutes for last month were posted on the website. Julio asked if there were any objections to the minutes as posted on the website. There were none. Brandon made a motion to accept the minutes, seconded by Miguel. The minutes are accepted as posted. Corresponding Secretary – Lloyd advised that there was no mail. The box was empty. Hamfest – Lloyd advised that he almost has the location worked out. He hopes to have a walk thru on Wednesday or Thursday. They gave us a big drop in the price. It will take place at SW 8th Street and Krome Avenue in the Miccosukee tent. Once everything is completed, he will send out an email. Website – Ryan is not present tonight. Julio stated that it has been updated. He continues to upload historical photographs of Ham radio. Club Elmer/PIO – Miguel nothing to report at this time. Since Steve was no present tonight, Miguel spoke about Field Day. Field Day will be June 28 and 29th. We will be joining the Everglades Club, Coral Gables Ares/Races and Miami Dade Ares/Races at JohnD.CampbellAgriculturalCenter at 18710 SW 288 Street in Homestead, FL33030 again this year for Field Day. Steve is taking reservations for those that wan to work specific bands. If interested, please contact Steve. We have received a 1 by 1 call sign of W4B for the event. Bring your equipment, antennas, and tents. We have a shelter if it rains. Treasurer – Brianna advised that she has nothing to report and is collecting dues for 2014. Julio stated that you need to pay your dues as we are updated the membership list. Newsletter – Julio put together a newsletter and Lloyd was passing out copies to everyone. Julio wants to get people back and to get involved. The newsletter will also be posted on the website. If you have any suggestions, please contact Julio. The members present congratulated Julio for a great job with the newsletter. Hambulance – Miguel advised it is a work in progress. We still need equipment and items. He read a list of what we still need. If you have any of these items, please see Miguel or Julio. Ham Classes – Armando advised that there are not enough people right now that are requesting classes. He advised that the Tech test expires this month and a new test will be in place next month. He said he was looking for VE’s to go to the VA Hospital for those that want to take the test and cannot come to the meeting. A lot of volunteers raised their hands. The 147.000 – Jason advised that it is being worked on. Miguel is trying to retrieve some equipment. The 147.760 – Ray advised that it is being used for nets and doing well. He will be tweaking it. The 224.200 – Julio advised that the antenna is up at Miami High. He is still working on it. The 444.200 – Carl was not in the room. Miguel advised it was up and running. The Digipeater – 144.390 – Miguel advised that he is working on it and it turns on and off. D-Star – Eddie advised it is up and running. Coverage has been up to about Sunrise in BrowardCounty. It is a 6 mile radius from Jackson. He has 25 requested users so far. He needs more people to join. Emergency Committee – Miguel spoke about the Ares/Races meeting that took place right before the DRC meeting tonight. He is accepting applications and they are on the miamidaderaces.org website under membership. Once you fill out the application and submit it, a background check will be done and then you will receive your ID. He also said that it is suggested that you take the FEMA courses – 100, 200, 700 and 800b online. It is not mandatory right now, but it will be in the future. If you already have an ID, you are already approved. Races meetings will now take place 4 times a year. They will be held right before the DRC meeting at 6:30 PM – 7:00 PM. Virgil spoke about preparing for hurricane season and rechargeable batteries. They don’t work very well. He purchased a bunch of batteries and a charger and they don’t last very long. He suggested getting a manual adapter and use regular batteries in it. Ray suggested that every June 1 to buy a supply of batteries each year and recycle them throughout the year after hurricane season. Ray advised that there is a checklist at Hurricanechecklist.com. Lloyd then gave his Hurricane Preparation presentation. He explained what supplies that we need and that we need to be prepared. Paperwork should be in waterproof containers such as a tackle box. Special needs persons need to pre-register. His presentation will be posted on the website. Great presentation! Dave came out of the testing room and announced that we have 2 new Generals tonight. Alain Arocha and Narciso Fumero. Congratulations to everyone! Julio said that we have a lot of new faces in the meeting tonight. If you have any questions, don’t be afraid to ask. We are here to help each other. Brandon made a motion to adjourn, seconded by Miguel. The DRC meeting was adjourned at 20:16.